What? You thought used examples lost value? Please. The is upon us, making its . This GT2 RS, like its predecessors, is the most extreme 911 one can buy. Therefore, be prepared to be pay extreme prices, even for used examples like this original 1996 993 GT2, the so-called “Holy Grail” of air-cooled Porsches. The exact asking price is $1,950,000. With just 25,699 actual miles, it’s just one of 194 Strassversion, or Street Version, units ever built. Porsche launched the 993 GT2 in 1995 and right off the bat it was guaranteed to be a collector’s item, but we wonder if Porsche ever imagined the price it’d fetch a little over two decades later. Compared to the 964, the 993 911 only retained the roof and front deck lid. Other than that literally everything else was new and it was one hell of a way to end an era. The 993 GT2 was simply icing on the cake. 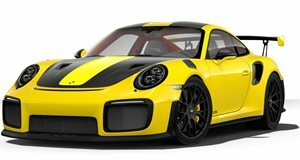 This particular example (we’re in love with the Speed Yellow over black leather interior combination) features fog lights, AC, power steering, an on-board computer, automatic limited slip diff, sport bucket seats, leather-covered steering wheel, radio and 18-inch wheels. Power comes from a twin-turbo 3.6-liter flat-six producing a total of 424 hp and paired to a six-speed manual. Zero to 60 mph happens in 3.9 seconds and it carries a top speed of 187 mph. Total weight? Just 2,855 pounds. , a ’95 model year, smashed an auction record last year with its $2,460,796 final price, so this just under $2 million example is something of a bargain. Everything is relative. Photos courtesy of craveluxuryauto.com via .